Logitech has added a new G533 Wireless Gaming Headset to its ever expanding portfolio of PC gaming peripherals. 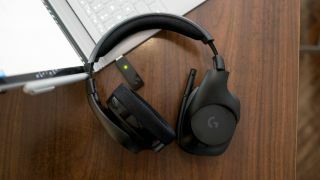 With a focus on solely delivering the best PC gaming experience, the Logitech G533 are designed to connect only to desktops and laptops with an included USB dongle. While you won’t be able to use this headset on consoles, it does offer DTS Headphone:X surround sound for a superior directional auditory experience. The Logitech gaming division also custom designed the Pro-G Drivers with a special fabric-hybrid materials than using the paper and mylar material found in traditional drivers. This result in lower frequency sounds being less easily lost in the mix of noise and distortion created by the drivers themselves. Logtitech has also managed to integrate a pop filter into the G533’s microphone to help add eight decibels of noise reduction. Elsewhere, the peripheral maker has put a focus on comfort and cut down the weight of the G533 to a scant 350g, making it one of the lightest wireless gaming headsets around. As a result it’s missing many of the aesthetic flourishes of the Logitech G993 including metal accents and RGB lighting. However, the G533 hasn’t lost anything in the way of performance with a wireless range of 15-meters and 15 hour battery life. The Logitech G533 Wireless Gaming Headset will be available soon this month and comes priced at $149 (about £120, AU$210).